Let us now praise MoMA. Or more specifically, a recent website from New York’s Museum of Modern Art that complements – or perhaps we should should say constitutes – an exhibition of modern photographs from the Thomas Walther collection. The interactive display is simply among the very best online presentations of historical images that I’ve encountered. At its core are 341 photographs made between 1909 and 1949 that exemplify many of the key strands of modernist image-making sometimes bundled together as the New Vision. Artists represented, of which there are 141, include Berenice Abbott, André Kertész, Alvin Langdon Coburn and Edward Weston, as well as a host of lesser-known but richly interesting figures. Each of the images is reproduced with a full catalogue entry, and there are short biographical essays as well as more extensive discursive analyses, such as Quentin Bajac’s The Age of Distraction: Photography and Film (a downloadable .pdf). All of this is connected to an exhibition at the museum, Modern Photographs from the Thomas Walther Collection, 1909-1949, and a book, Object:Photo. Modern Photographs: The Thomas Walther Collection 1909–1949, but given the riches of the web display, these feel almost like add-ons to online, especially if you live in London with only modest book-buying resources. To disseminate the project’s results and to foster continuing collaborations with colleagues near and far are the driving concerns of this extensively detailed, interactive digital research platform. This website—Object:Photo. 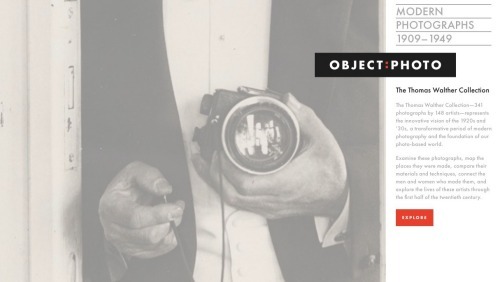 Modern Photographs: The Thomas Walther Collection 1909–1949. An Online Project of The Museum of Modern Art—is unprecedented in its functionality, providing virtual access to the objects in exceptional depth, along with wide-ranging scholarship on the photographs’ historical context and significance. You recognise the validity of Lowry’s claim that the website is ‘unprecedented in its functionality’ as soon as you start to explore beyond accessing individual images. One section, Mapping Photographs, visualises over time the places where the images were taken and the key meeting-places, such as exhibitions, schools and industrial centres, that linked the artists. And an even more sophisticated visualisation, Connecting Artists, shows relationships between the creators and these meeting points. Each of these, and the other ways of exploring the research, brings you back to individual images at the same time as they embed the photographs within geographies, historical moments and social and intellectual contexts. For me, Object:Photo is as revealing and as involving and as enriching and, yes, as educational, as a visit would be to the exhibition or several evenings pouring over the book.